Oh, what an indictment, eh? Well, not exactly. The Times, which on Dec. 5 ran a front-page editorial (the first since 1920 when it took Republicans to task for nominating Warren G. Harding for president) against guns, was citing a study by Daniel Webster, the director of the Johns Hopkins Center for Gun Policy and Research. But as gun scholar John Lott Jr., president of the Crime Prevention Research Center, pointed out for me last week, “cherry picking” results tend to give you the results you're predisposed to seek. As Mr. Lott found, in an exhaustive 2014 review of Mr. Webster's research, the results are more complicated than simply looking at what the average murder rates were before and after rescinding the Missouri law. “While it is true that the murder rate in Missouri rose (about) 17 percent relative to the rest of the United States after the law was changed, it had actually increased by 32 percent during the five years prior to the change,” Lott then wrote. But the bottom line remains this: “Imposing the law raised murder and robbery rates,” Lott told me. “Removing the law lowered them.” . . . The issue of cherry-picking is much broader than this. The question is if you have 20 states that have had these expanded background checks, why pick only one state to look at? If Missouri enacts this law in 1981 and rescinds it in 2007, why only look at when it is rescinded? The proper way to examine this question is to look at it the way Lott did in the third edition of More Guns, Less Crime as it examined all the states that have adopted or rescinded these types of laws between 1977 and 2005. Those estimate showed no benefit in expanded background checks reducing violent crime. My newest piece at Fox News: "Open carry comes to Texas: Why the Lone Star state will be safer in 2016"
Amidst today’s threats of terrorism and mass public shootings, it is a good thing when we enable people to legally carry guns and protect themselves. Under the new law, a person will need a concealed handgun permit to be able to openly carry a gun. If the experiences of other states are any guide, few people will actually openlycarry their handguns. Moreover, businesses can still prohibit guns or request that they be concealed. However, the Chief Financial Officer of Kroger (America’s largest supermarket chain), has just said that the company will allow open carry. He says that the company hasn’t encountered any problems with open carry. Other supermarket companies such as Whole Foods, Randall’s, and H-E-B, will be posting signs banning open carry. They will still be allowing concealed carry. These bans may be short lived. When Texas originally passed concealed carry in 1996, many stores initially posted signs banning concealed carry. With a few years, those signs all but disappeared. An odd nuance in Texas law has led to much national attention in the last couple of years. Before Friday, people were allowed to openly carry rifles, just not handguns. No problems ever occurred, but simply the additional handling required for carrying rifle as opposed to keeping a holstered handgun, certainly created concern that something might go wrong. Some, such as Michael Bloomberg’s Everytown advocacy group, put pressure on companies to ban openly carried rifles. Starbucks, Jack in the Box, Chipotle, Wendy's, Applebee's, Chili’s and Sonic’s all “respectfully request” that customers not openly carry guns. More importantly, however, they still allow people to carry a concealed gun. . . . . Even before our piece was listed on Fox News' front page, it was the most read piece in the opinion section. Here is an interesting video on discussing the practical differences in carrying open versus concealed. After plunging from more than $100 a barrel to nearly $50 a barrel last year, U.S. oil prices fell 30% in 2015 to $37.04 a barrel. Brent, the global benchmark, fell 35% to $37.28 a barrel. Vladimir Putin goes into 2016 with record approval ratings but the shakiest economic outlook since he took charge. In the 15 years he has been at the helm, 2015 was the first year that real wages registered a decline, something that did not happen even during the 2008-09 financial crisis. Oil and gas exports make up about half of the Russian budget, and the rouble ratehas been strongly linked to the price of oil. . . . The [Rubble] regained some of its value by spring, but falling oil prices in autumn have caused it to fall back to lows similar to those it experienced in late 2014. . . .
Last October, Putin said that if the price of oil fell below $80 a barrel, the world economy would crash. A range of other top Russian officials made similar statements, in effect ruling out the possibility that oil could fall below $70. Some analysts say the rouble is still overvalued, and the current oil price should theoretically push the rouble down further. This is necessary to balance the budget: the fewer dollars Russia receives for the oil it sells, the higher the exchange rate needs to be for the budget to receive the requisite amount of roubles. For the budget to balance at 65 roubles, not far off the current rate, the price of oil should be $70, a recent Bank of America Merrill Lynch report found. For ordinary Russians, it could be a tough year ahead. Those who were used to travelling abroad have already had to scale back as the rouble made the cost of visiting foreign cities prohibitive; and rising food prices have made it harder to balance the books for many families. The 2016 budget, fixed in October, requires oil to be at $50 in order to run a 3% deficit within “acceptable” rouble rate limits, meaning if the price does not rise soon, cuts will need to be made or reserves spent. The war in Syria is an extra cost, and the announced increases in military spending are not likely to be reversed. . . . When oil prices drop, Russia suffers greatly. Oil and gas comprise over 60% of Russia's exports and make up over 30% of the country's gross domestic product (GDP). The effect of the 2014 oil price collapse on Russia's economy was fast and devastating. 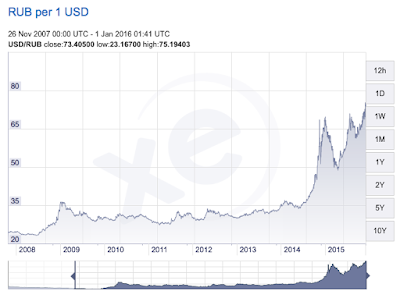 Between June and December 2014, the Russian ruble declined in value by 59% relative to the U.S. dollar. At the beginning of 2015, Russia, along with neighboring Ukraine, had the lowest purchasing power parity (PPP) relative to the U.S. of any country in the world. A declining PPP lowers living standards, as goods purchased using the native currency become more expensive than they should be. Moreover, Russia does not receive much of an economic benefit from lower pump prices as the U.S. does, as Russians consume much less oil and gas than Americans. Less than 30% of the Russia's oil production is kept for domestic use; the rest is exported. . . . 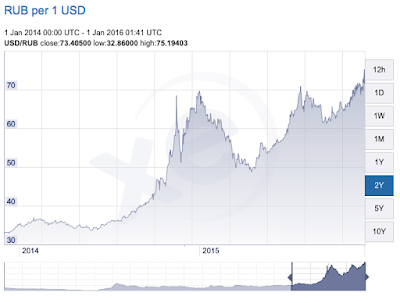 Some graphs here show how much the value of the Rubble has fallen relative to the US$ since the beginning of 2014 and 2008. 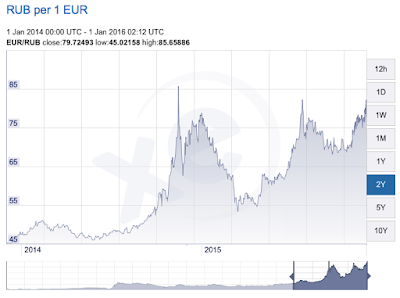 Here is the drop in the Rubble even compared to the EURO. My continued debate with Gary Kleck over his attacks on "More Guns, Less Crime"
In mid-November I got into an exchange with Gary Kleck about "More Guns, Less Crime." This took place after other Kleck statements to the media about me. In the new discussion, Gary continues to go out of his way to engage in personal attacks on me: "he instead invents a distorted straw man," "presents a fantasy version," "Lott’s version of economic theory is one that has been dead for decades," "One of Lott’s many errors is to blindly assume," "In his efforts to distort my positions . . . blatant falsehood," "This is pure invention," "Lott’s error was in simplistically assuming," "Lott tells another especially bizarre whopper," and "The rest of Lott’s comments are filled with misinformation that betrays an extraordinary ignorance of the research literature." Kleck: "Lott tells another especially bizarre whopper about me: 'Gary feels very strongly that gun ownership doesn’t make people safer.' This one is especially weird because I am usually attacked by pro-control people for my research showing the defensive gun use is both frequent and effective. . . ."
Lott: Take this quote from Gary’s initial interview with Ari: “across areas, there is no effect of gun ownership rates on crime rates, including homicide rates.” And in his last posting he makes the claim: “national gun ownership rates have no net effect on national homicide rates (the position I [Kleck] endorse).” But Gary has been making this claim even more broadly for some time. Similarly, this past summer, Gary told Mother Jones magazine: “Do I know of anybody who specifically believe with more guns there are less crimes and they’re a credible criminologist? No.” Gary is saying clearly the debate isn’t just about whether guns are increasing. He is claiming that even if gun ownership is increasing, there won’t be reduced crime. Everyone knows of Gary’s work on guns being used defensively, but there is a contradiction here. While Gary points to guns being used defensively and those defensive uses exceed the number of times guns are used in the commission of crime, he repeatedly says that increased gun ownership doesn’t reduce crime. I don’t understand why Gary claims that more gun ownership doesn’t mean less crime, and I have asked him about this in multiple conversations, but whenever I have asked him to explain how these different claims could be reconciled he has declined to do so. People can read the debate themselves available here.
. . . For his part, Armstrong wrote that he personally knows people who carried guns after getting their permits but not before. I do as well — in fact, I'm one of them. And a closer look at the TSA data reveals a stark pattern: More guns are being found in states with permissive concealed-carry laws, but not in states where it's hard to get a license. . . . The trends are much more convincing. The stricter states accounted for 157 guns in 2012, 141 in 2013, and 165 in 2014 — a pattern consistent with randomness, with a decrease between the first two years. The states that grant permits liberally, by contrast, saw their gun count climb steadily and dramatically, from 1,334 to 1,652 to 1,945. Many of these states saw substantial increases individually as well. Texas's number rose from 292 to 417. . . .